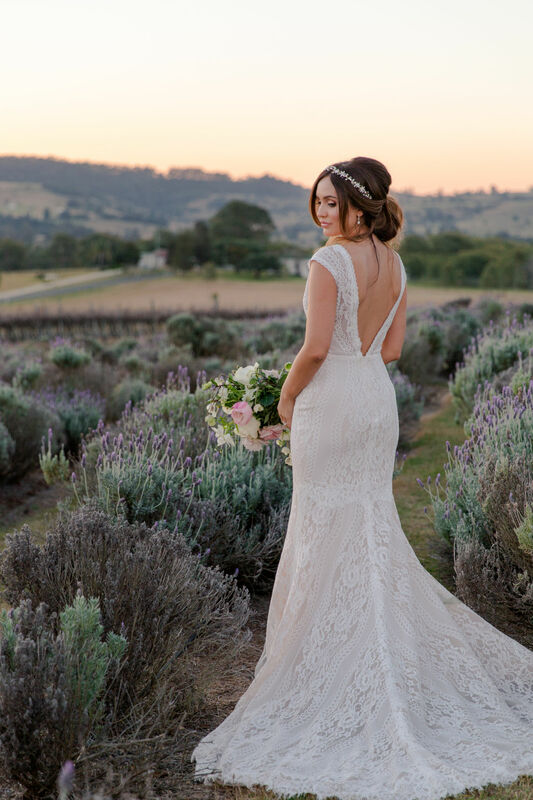 Today I am thrilled to share this stunning lavender inspired wedding shoot. 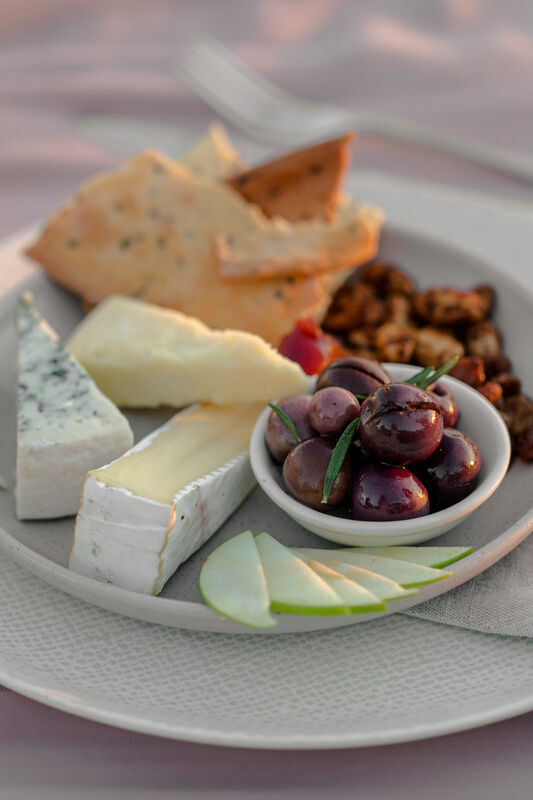 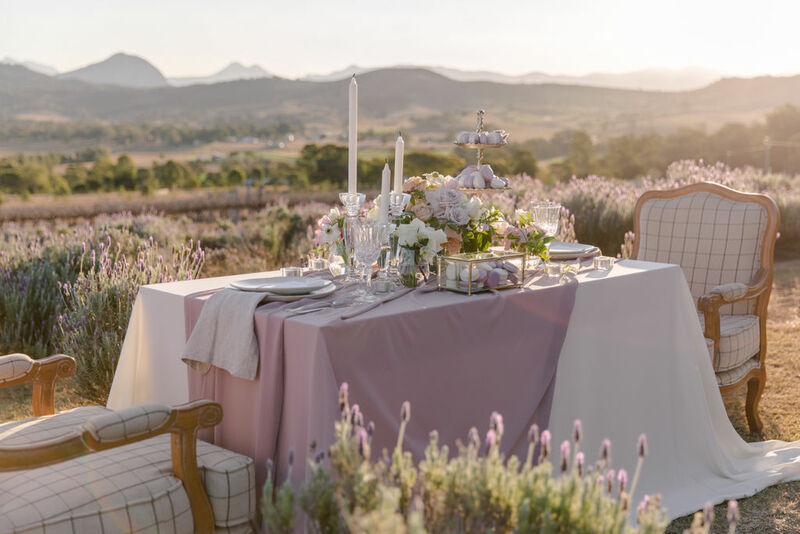 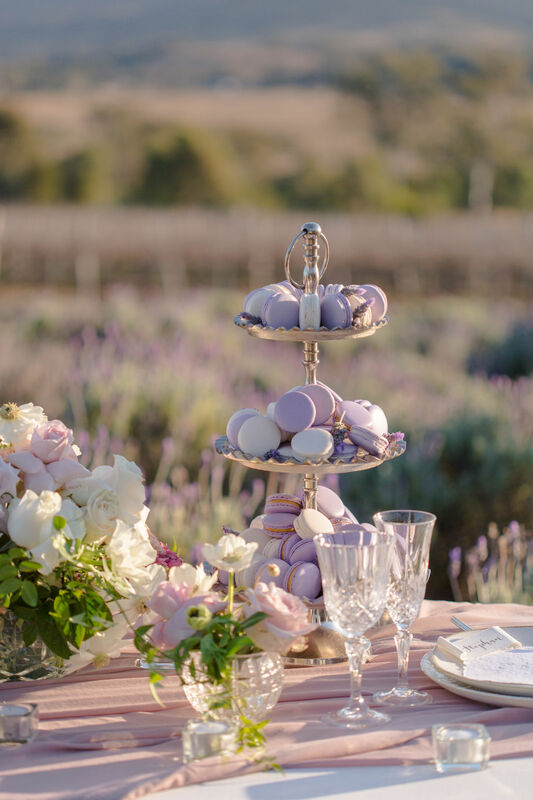 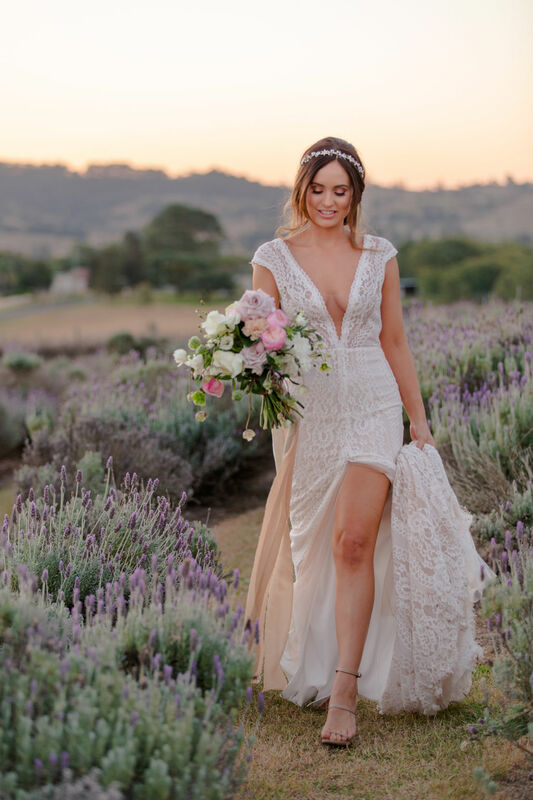 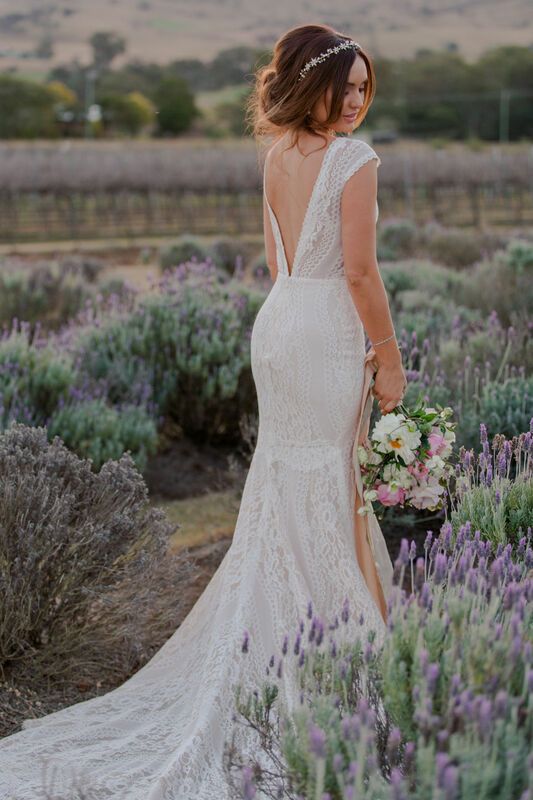 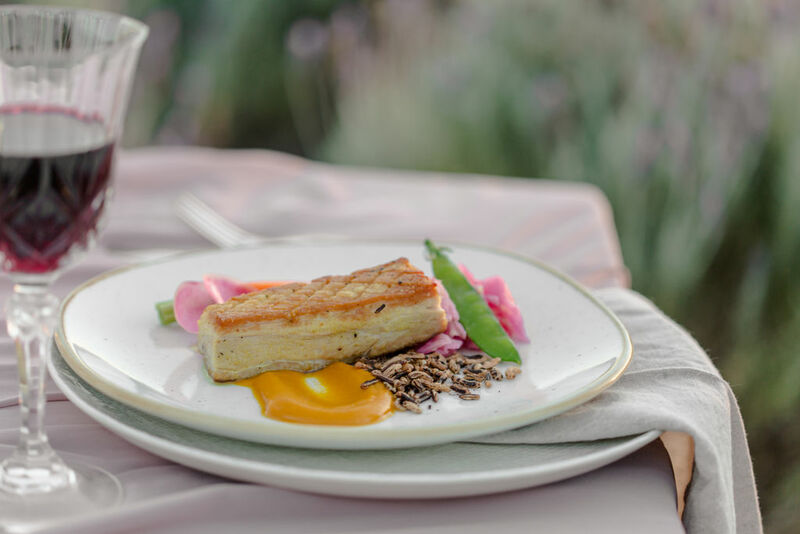 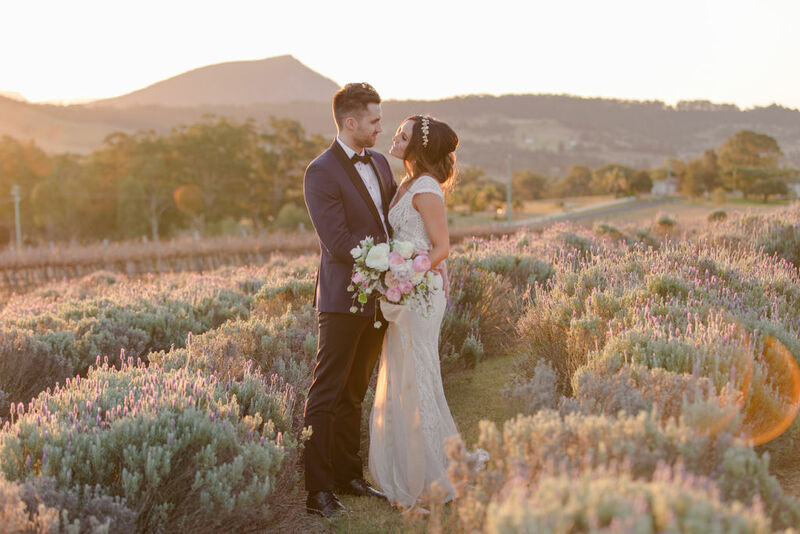 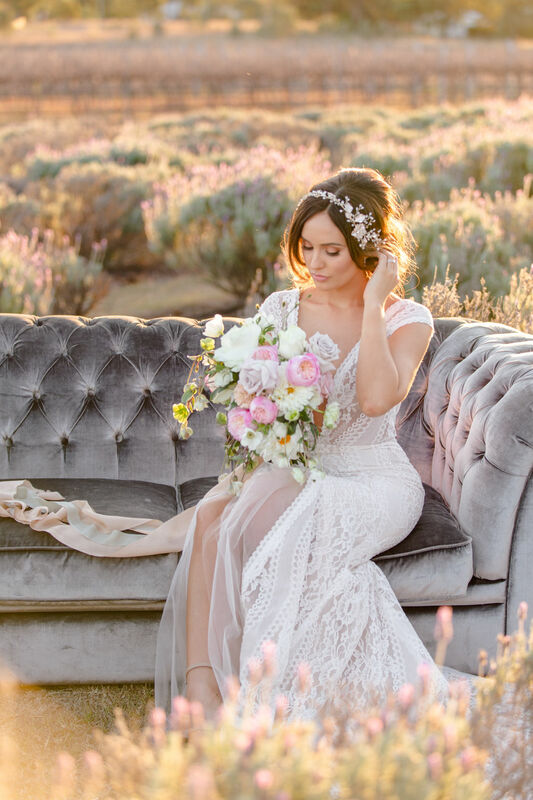 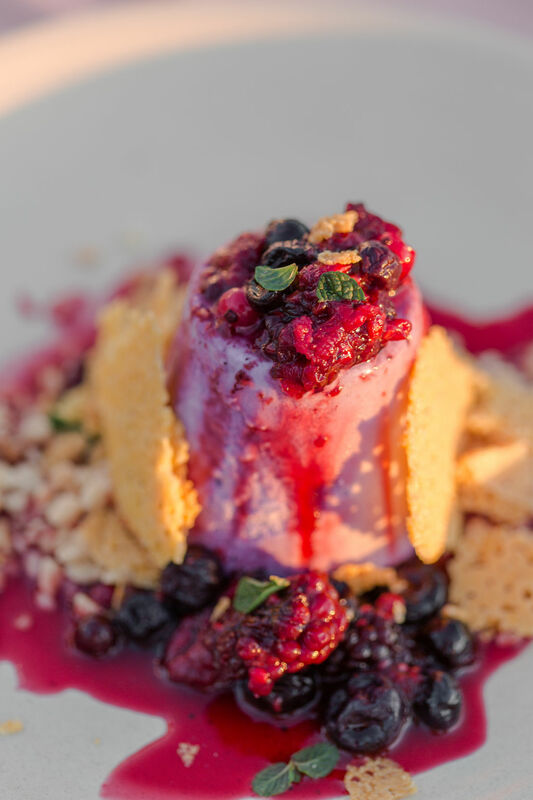 This beautifully styled concept is set amongst alluring lavender fields at Kooroomba Vineyard and Lavender Farm in the gorgeous Queensland countryside in Australia. 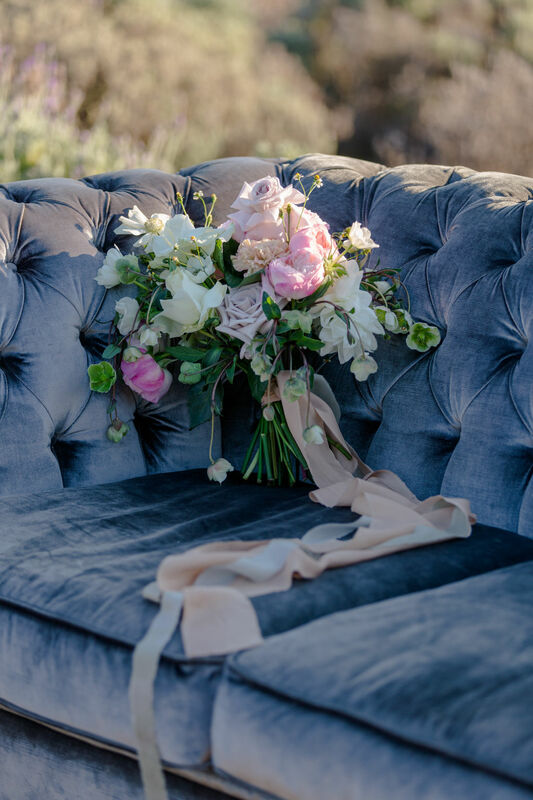 Images were captured by Just for Love Photography with the creativity of an incredible collaborative team. 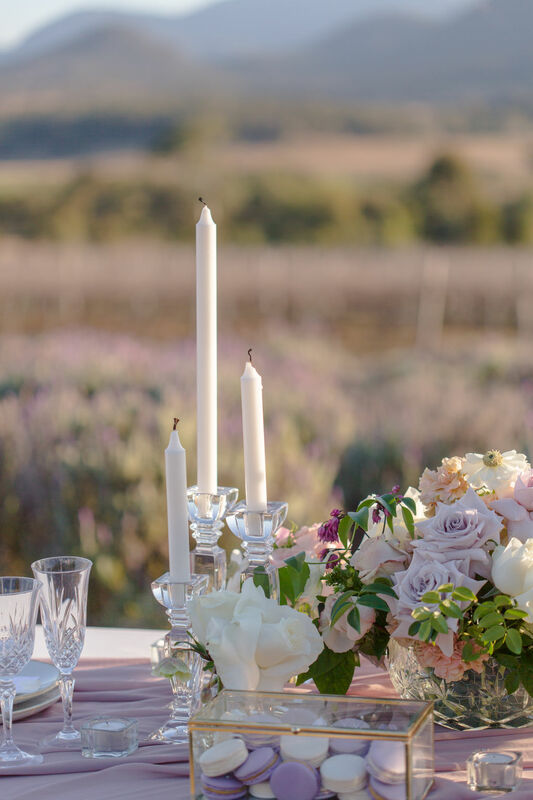 So you can imagine how excited I was to hear about Kooroomba Vineyard and Lavender Farm last year. 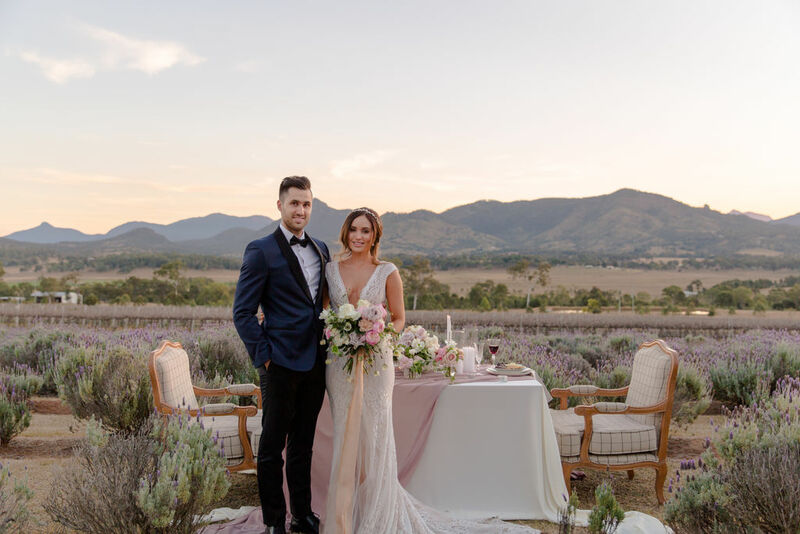 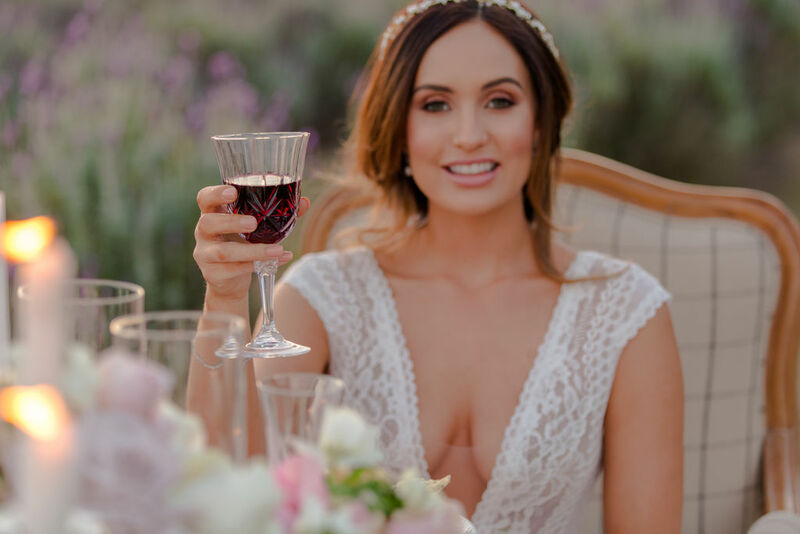 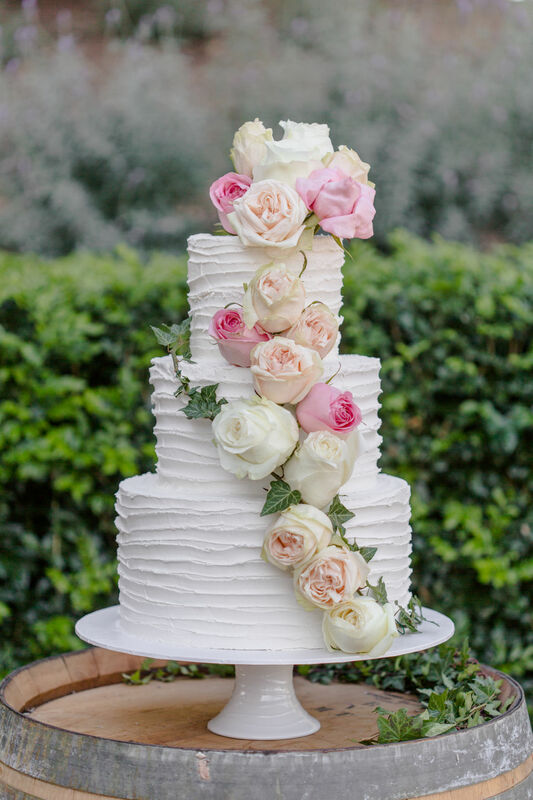 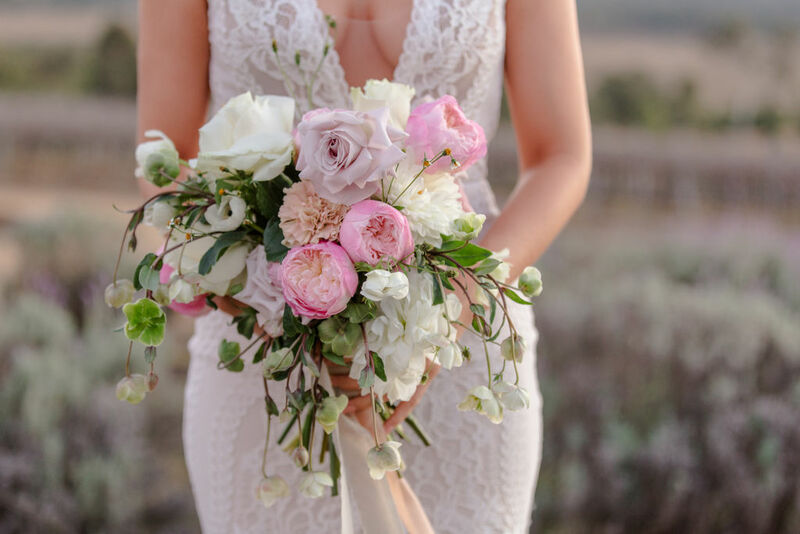 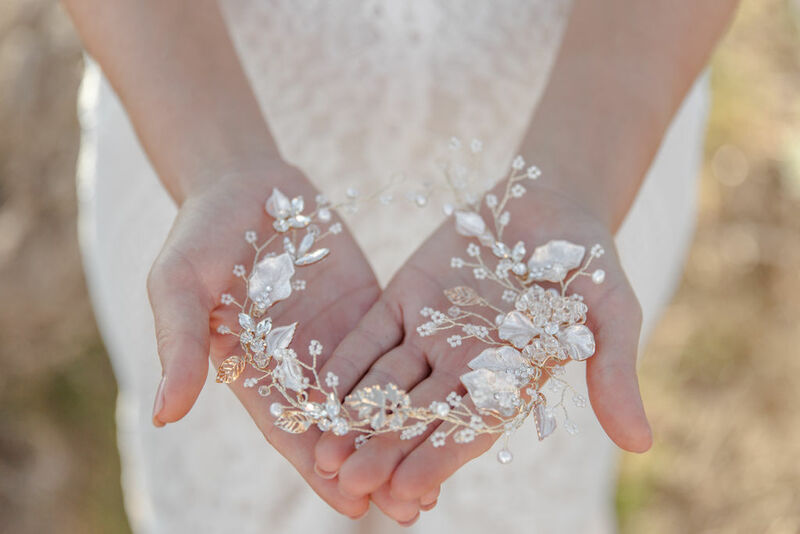 Inspired by the lavender farms in southern France, this incredible venue is honestly the only one of it’s kind in Queensland – so of course, I gathered some of my favourite Brisbane wedding vendors to create some stunning wedding inspiration. 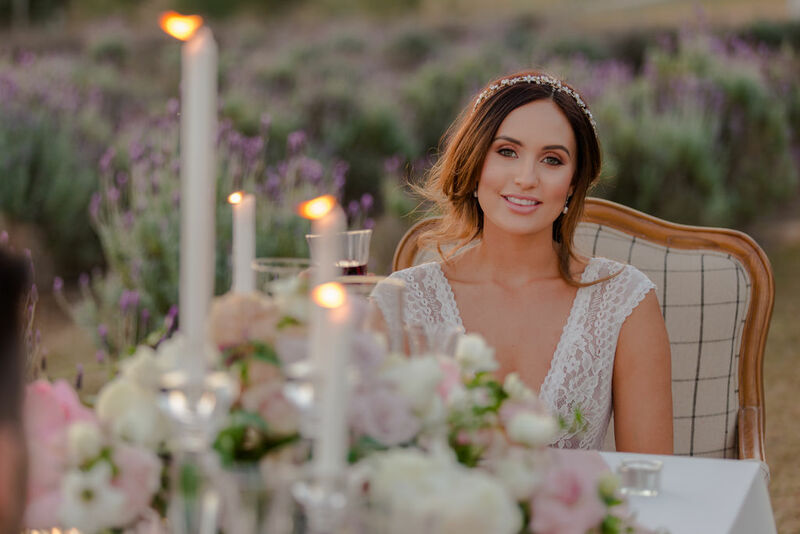 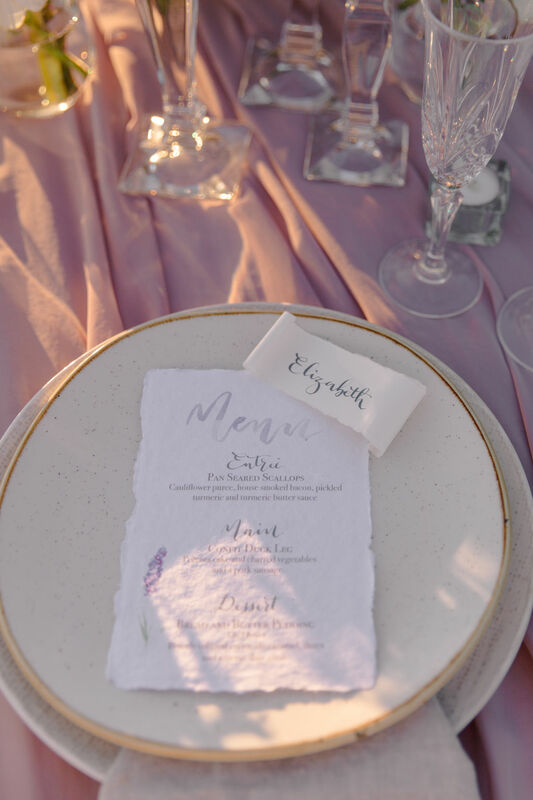 Jessica of House of Lilley styled a table of lavender linens, beautiful taper candles, floral arrangements of rose and jasmine and gold cutlery from Gold Wedding Hire. 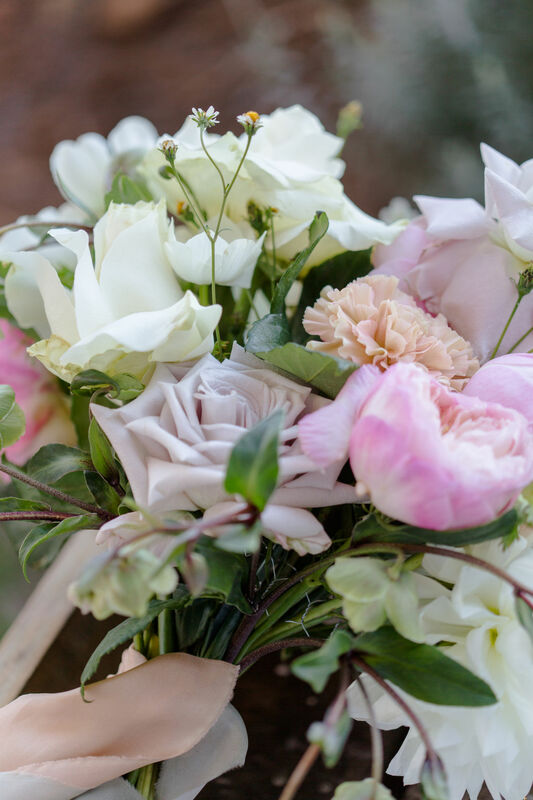 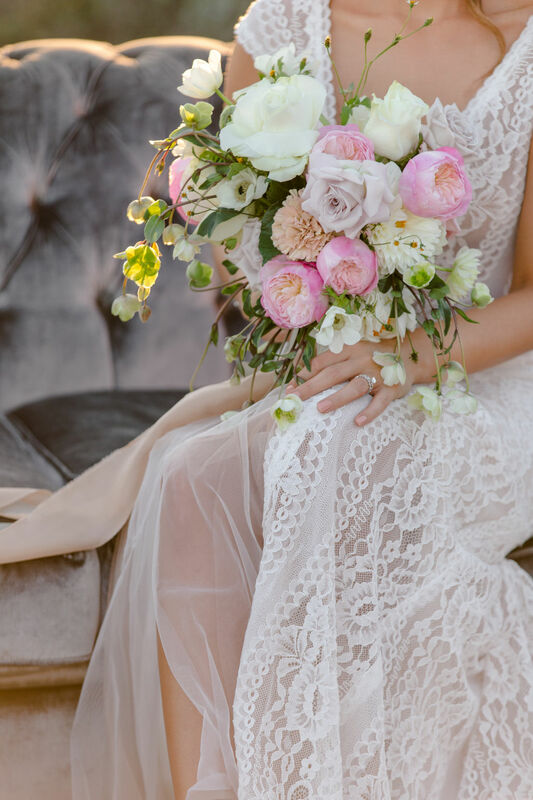 Floral designer Mrs Gibbons Flowers was also inspired by the streets of Paris in her arrangements, using the stunning natural backdrop to enhance her softly hued bouquets finished beautifully with silks from Songbird Silks. 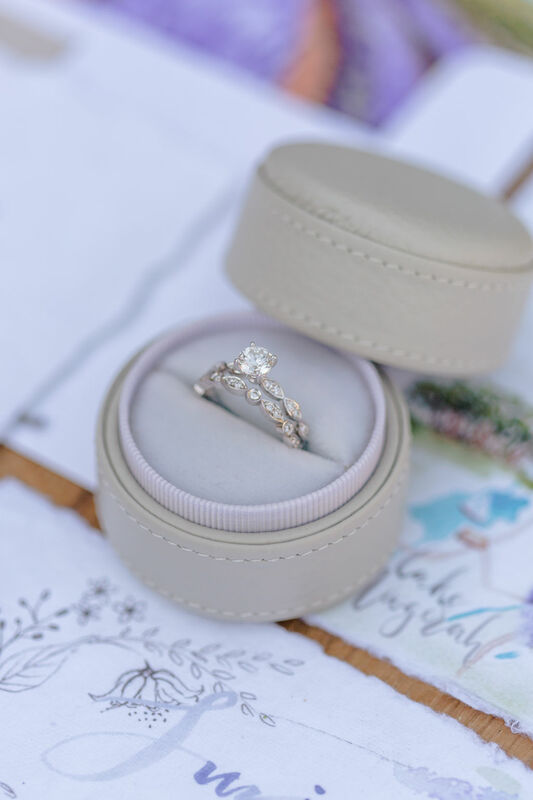 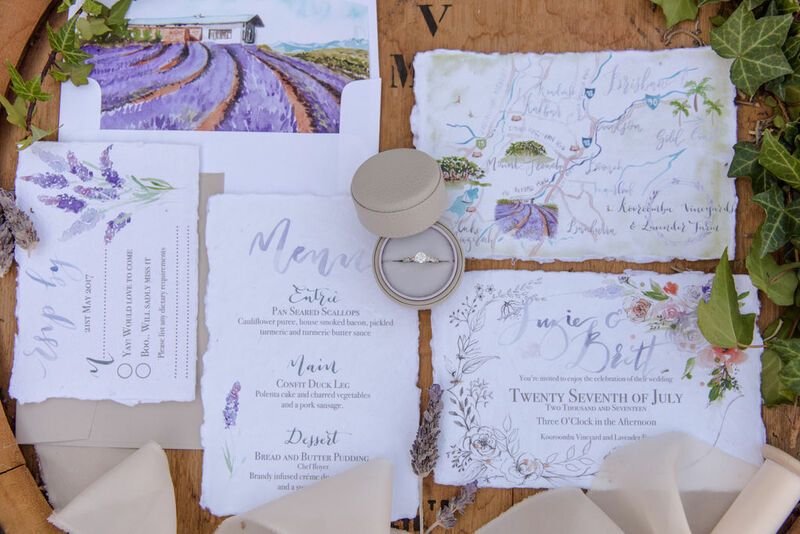 Hand painted invitations by I Am Poppy Designs and a lavender ring box by Amonie provided a beautiful finishing touch. 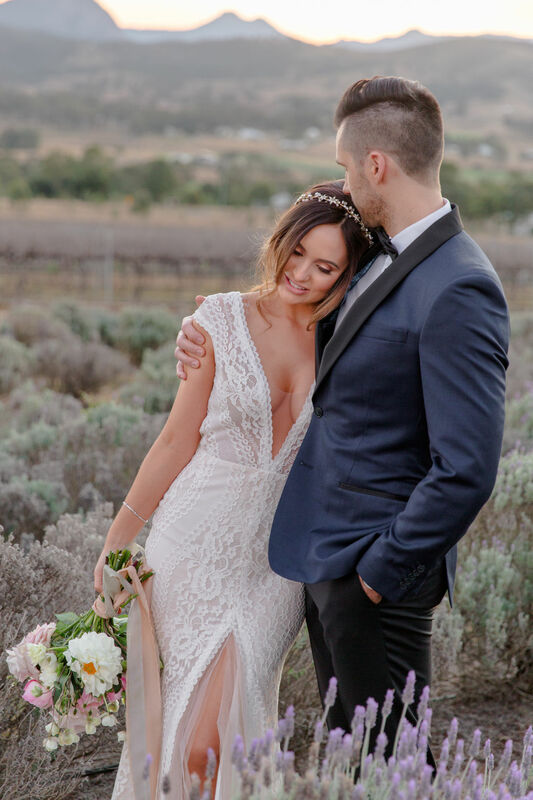 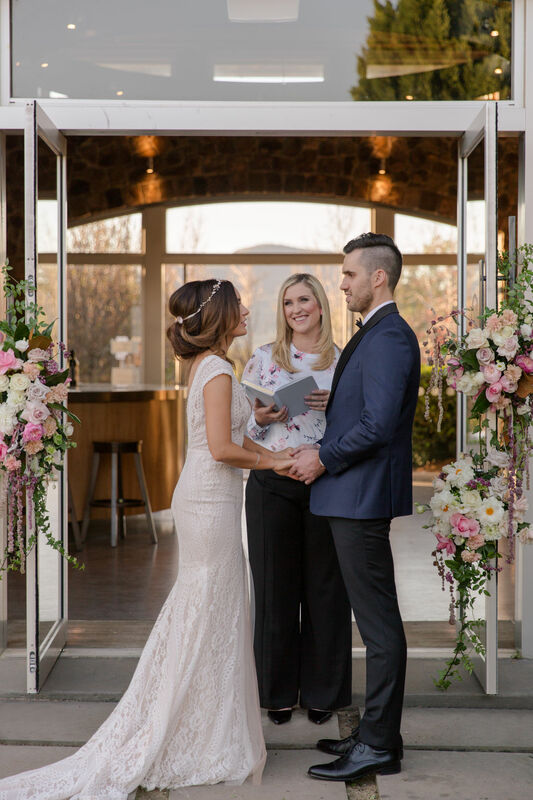 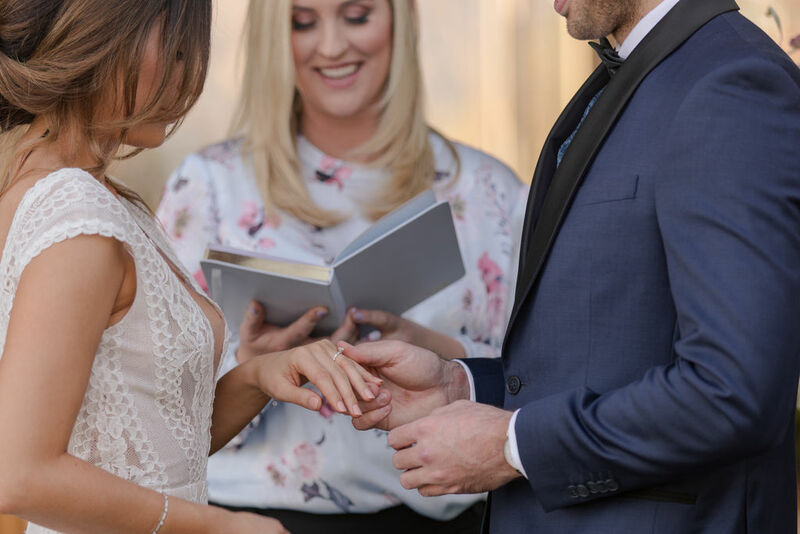 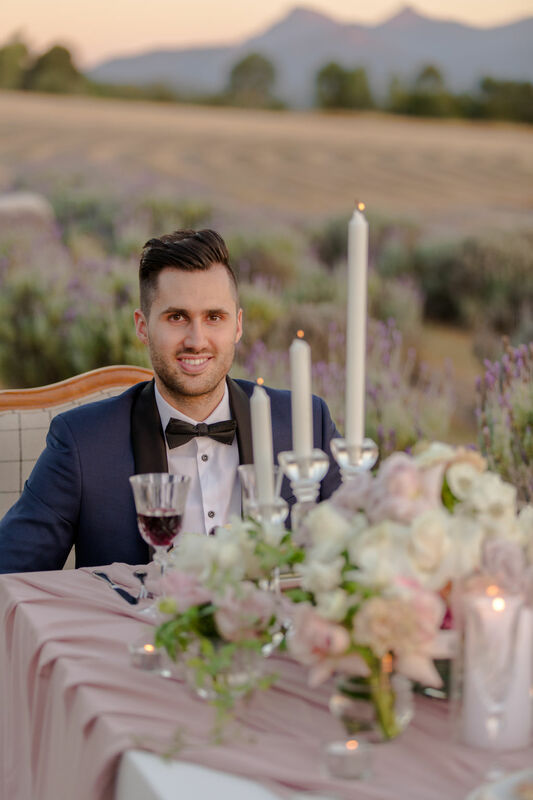 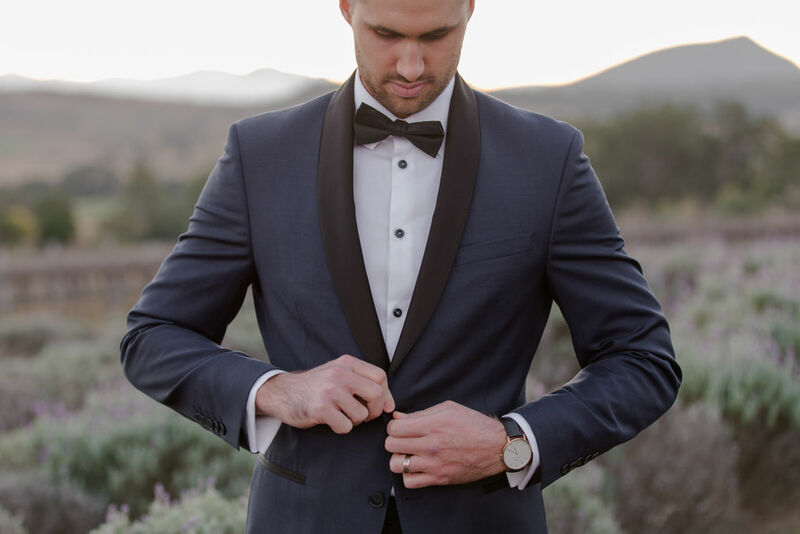 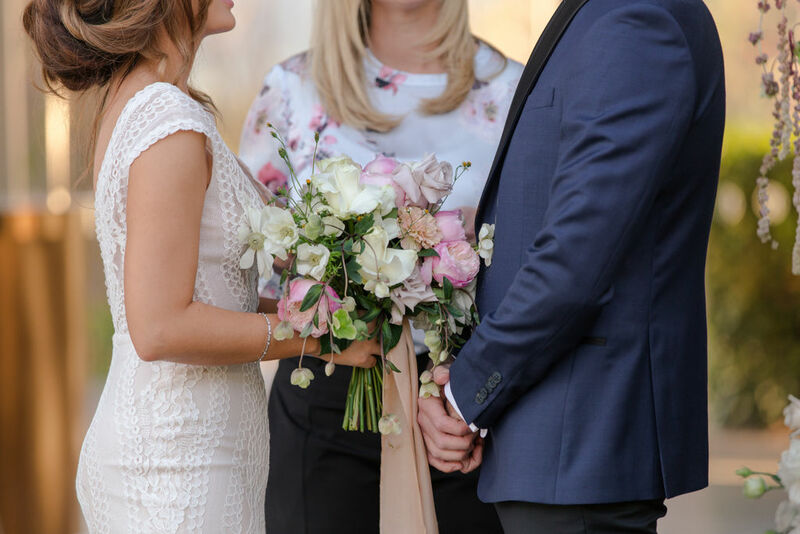 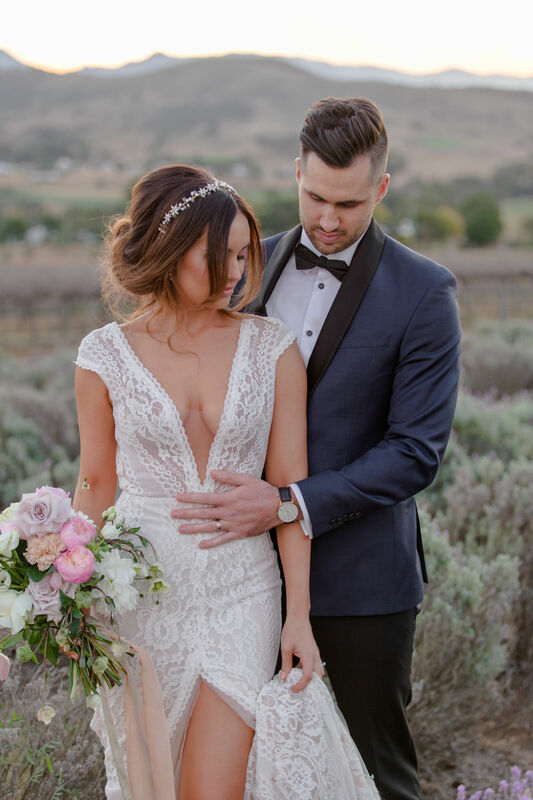 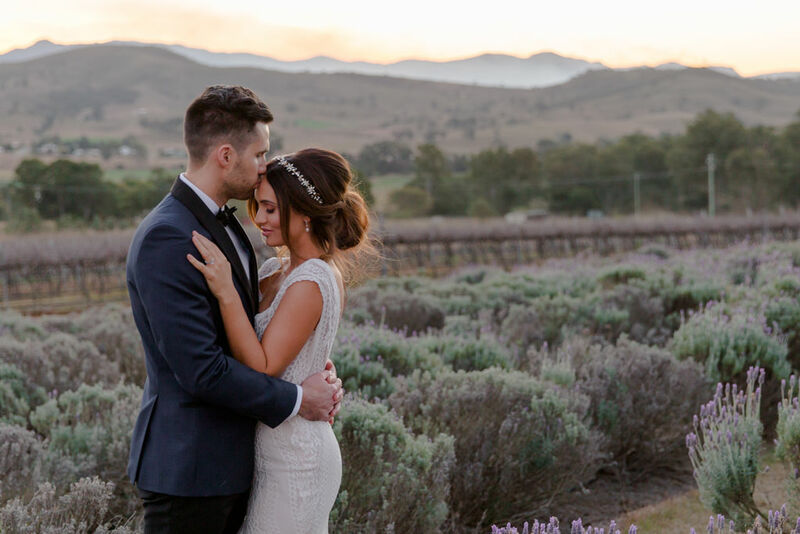 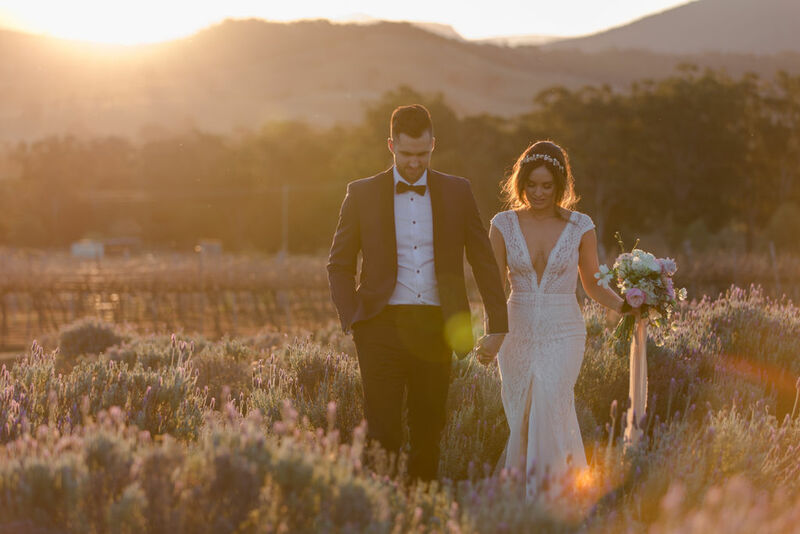 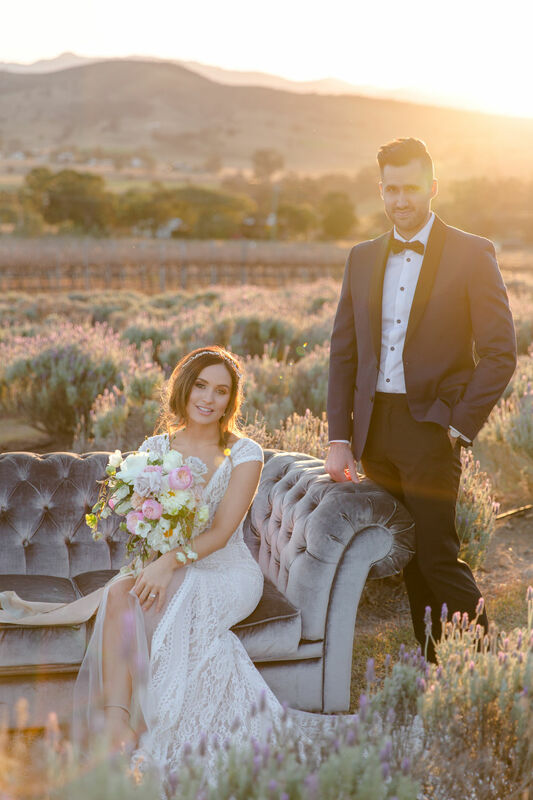 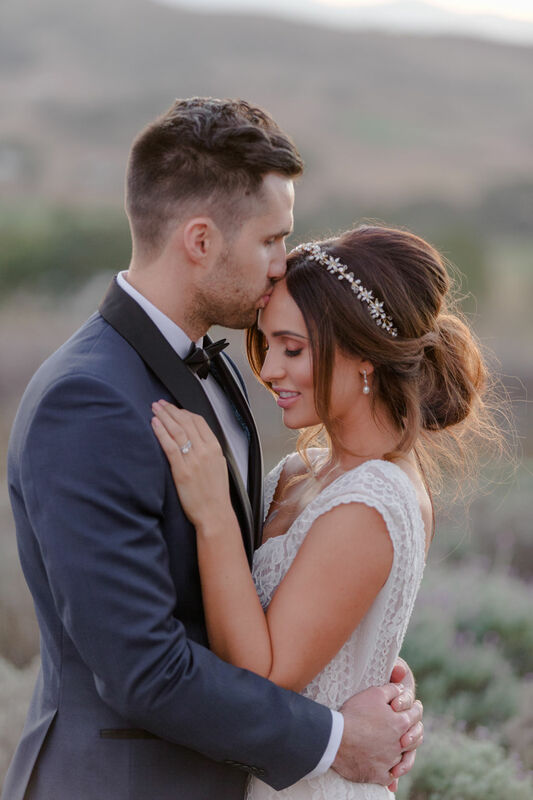 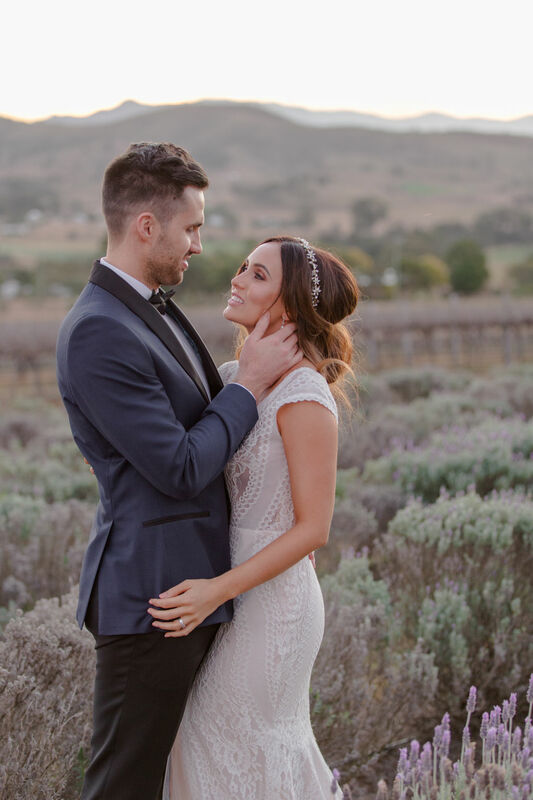 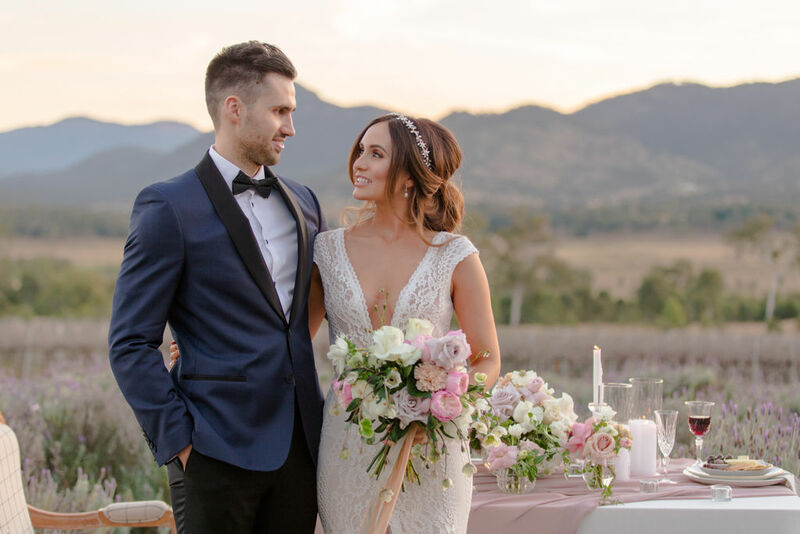 Our couple Kitty and James were wed by Two Small Words dressed in elegant attire by Emmy Mae Bridal (the sister company of Made With Love Bridal), Black Jacket Suiting with the wedding veil and accessories by Simona Bridal. 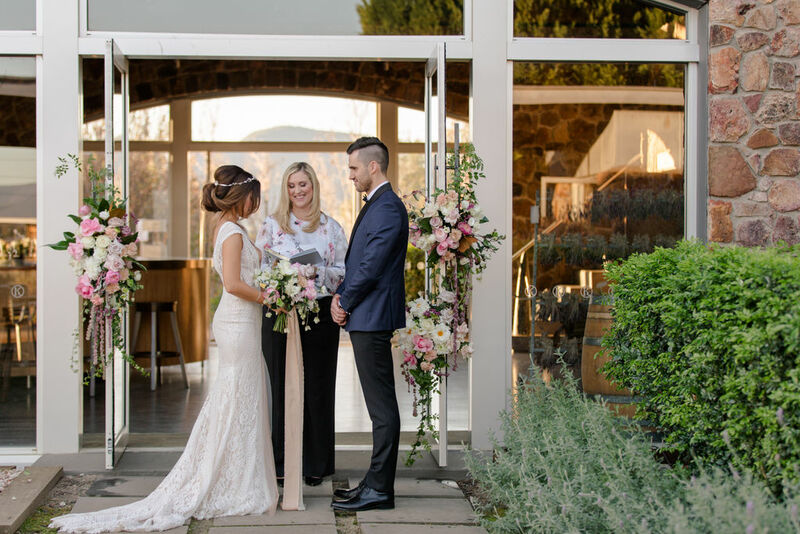 In line with the European inspiration for this shoot, we decided to use the exterior of the cellar door for the Ceremony space. 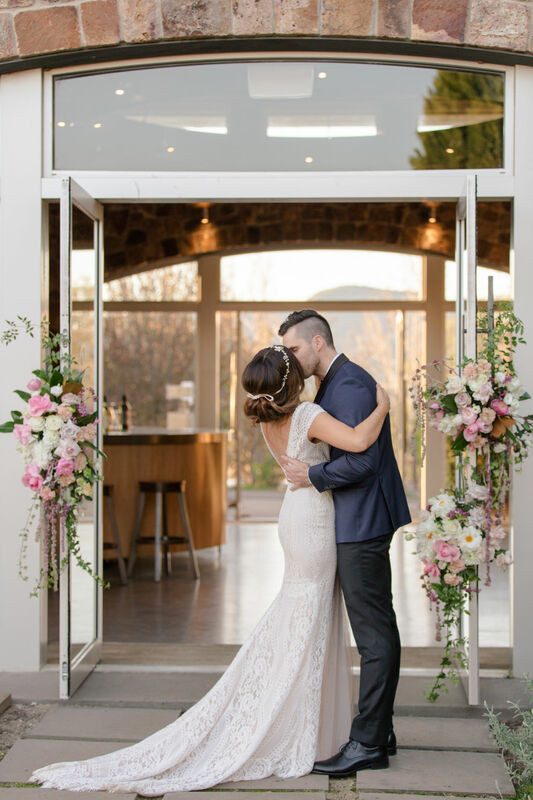 The exposed stone wall is so stunning and once again Mrs Gibbons Flowers created some incredible floral installations for the sides of the entrance doors, transforming them into a vertical wedding arch! 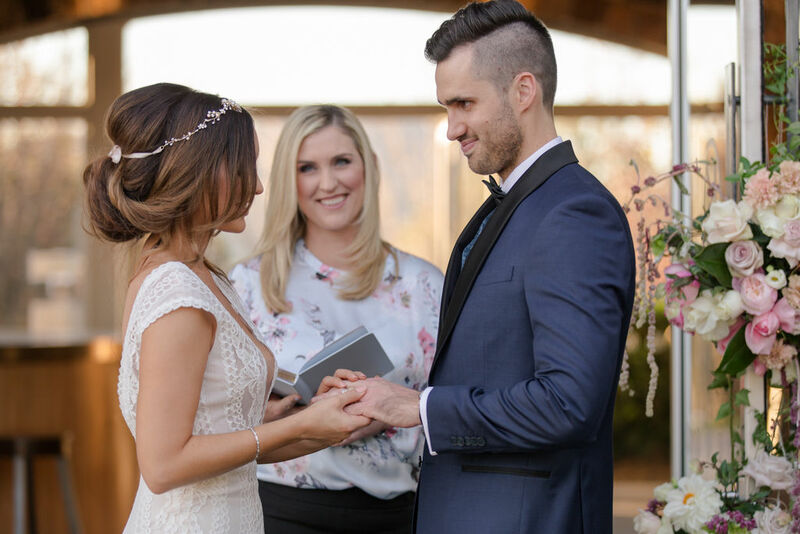 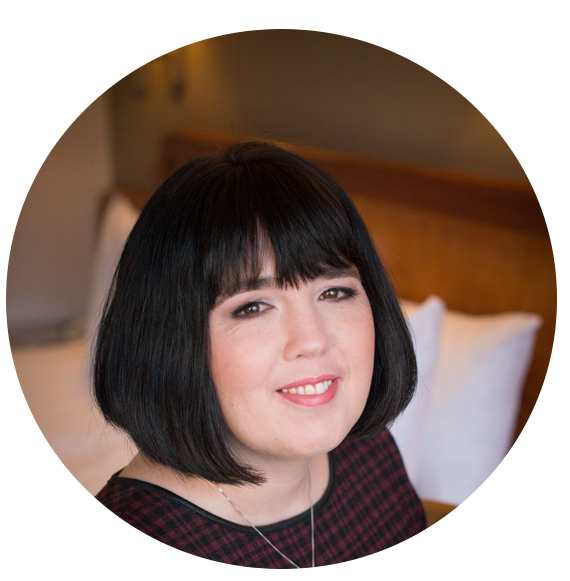 Hair and Makeup was beautifully styled by Jody Callan Hair and Prue Conway MakeUp. 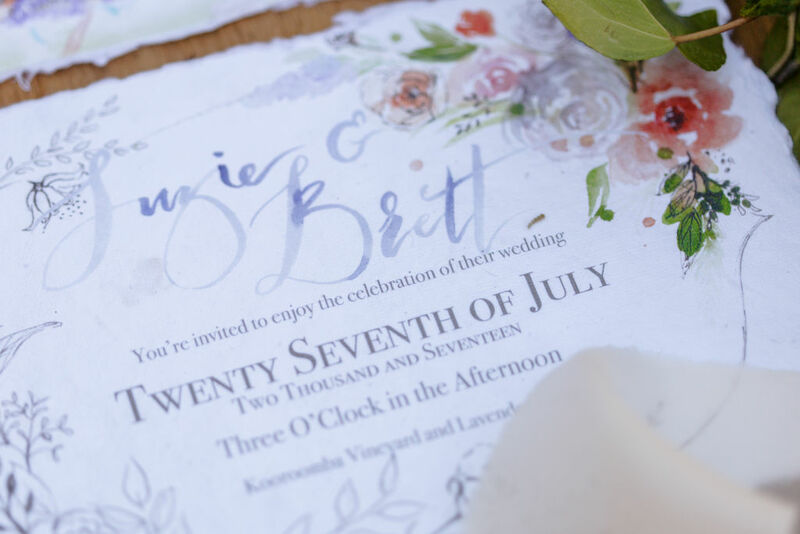 I LOVE working with other creatives on these kinds of shoots – it’s a real treat to see how they interpret the vision and bring it to life! 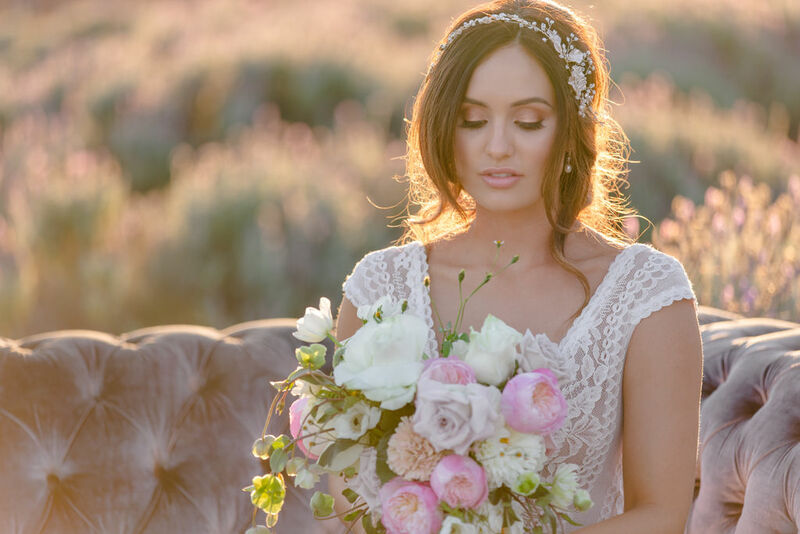 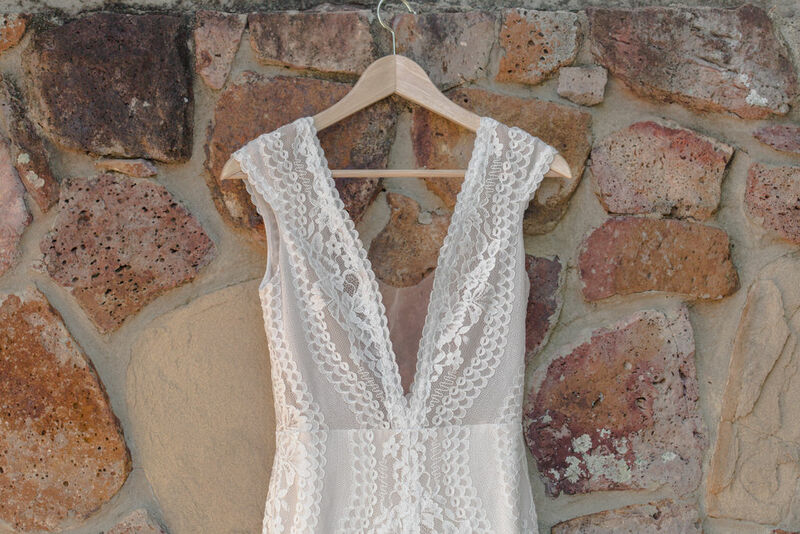 Isn’t the shoot just dreamy. 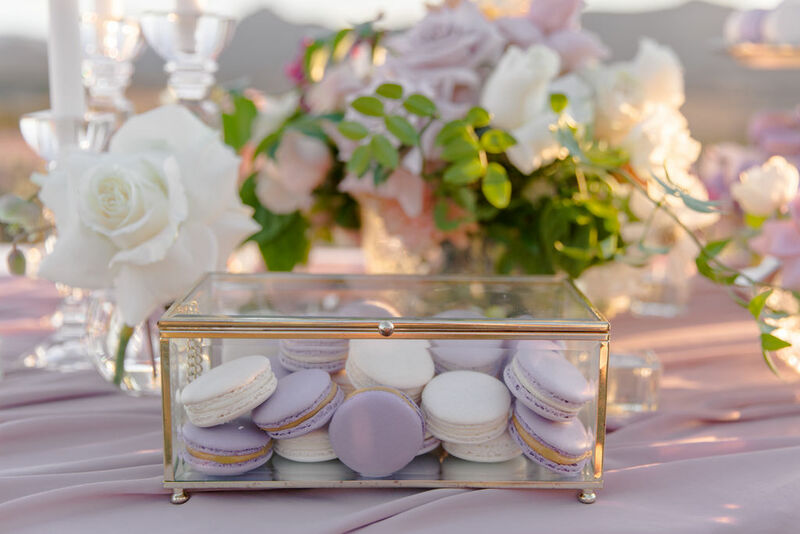 The hue has a lush sophisticated feel to it and complimented with richer hues at times and a hint of gold gives the palette so much more depth. 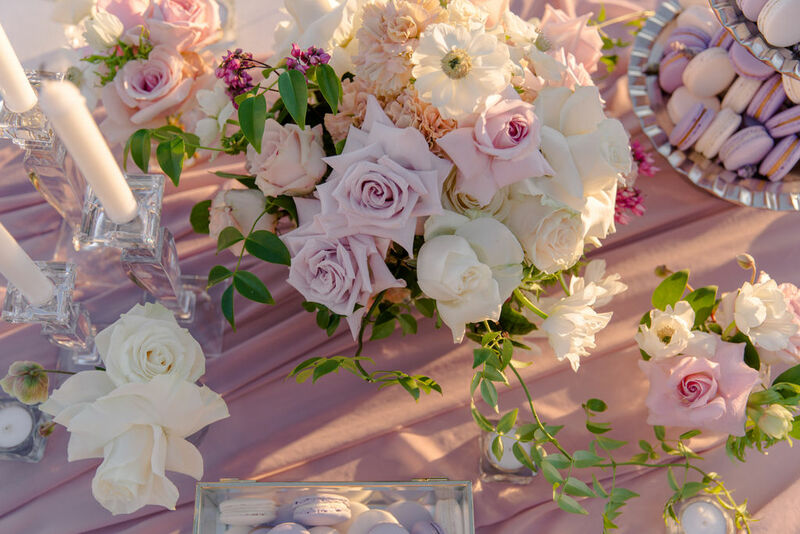 This enchanting shade packs a breathtaking punch and is perfect for your celebration drawing you in with its beguiling charm.